India's young speedster Umesh Yadav has said it was Sachin Tendulkar who encouraged him to work on a "surprise delivery" to bring about more variety in his bowling. "It's because of Sachin that I am working on a new variation. 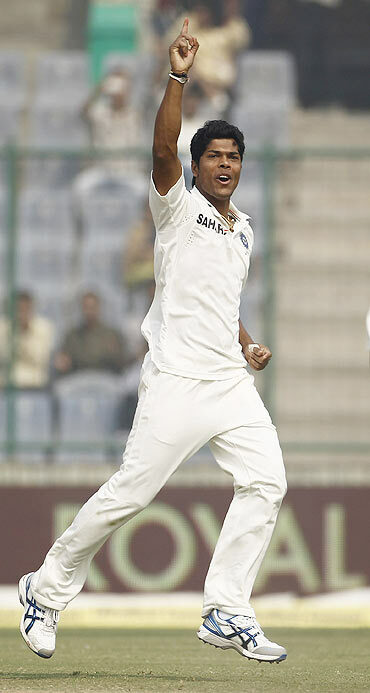 It was him who gave me the idea about my new weapon which can trouble many batsmen," Yadav said in New Delhi on Tuesday. Yadav feels that having a captain like Virender Sehwag is of great help as he gives the bowler a lot of free hand. "He himself being a very explosive batsman knows which balls are easy to hit and what puts him in a difficult situation. These are the things he shares with me and always keeps motivating me. "During the match, he has always told me to bowl with confidence. When I am bowling he is so confident about me that he always lets me set my own field." He has been touted by many as the man who would spearhead India's pace attack once Zaheer Khan retires but Yadav reckons that it will be tough to replace someone of Zaheer's calibre. "Zaheer bhai has been very helpful during times when I have got an opportunity to play alongside him. During pressure situations, he would always come up with some invaluable tips which has helped me. I feel honoured when people say that I can replace a bowler of his calibre. But it is never easy and it certainly won't happen overnight that you would become Zaheer Khan's replacement,"
During the two-week break that Yadav got after the gruelling Australia tour, he has worked on strengthening his shoulders. "For a fast bowler like me, working on increasing the strength of the shoulder is very important. My emphasis during the break was on improving my shoulder strength. At the same time, I had to also ensure that I didn't do excessive gym work as one might end up being a bit stiff," Yadav said. The 24-year-old bowler, who has played six Tests and 15 ODIs, said, "It would be best if I show it (surprise delivery) in the match rather than talk about it. But presently that delivery still needs a lot of work. 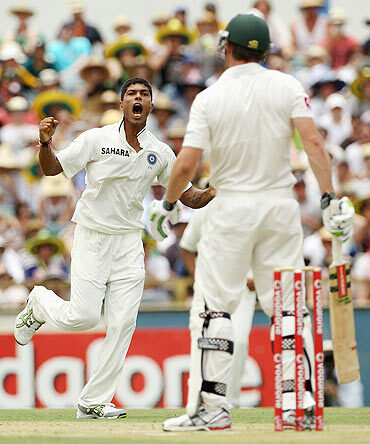 I shall be bowling those deliveries only when I am comfortable with them and confident enough to use them in a match." Asked about the vacuum created by Rahul Dravid's retirement, he said, "Rahul bhai is a classical batsman. His attitude, nature and calmness on the field are something I want to learn from him. Team shall surely miss his presence during the games. His place in the team will always remain vacant." T20 cricket demands bowler who can be effective at the death and Yadav agrees. "Death over bowling is all about variation. So to prepare for death overs I am working on varying my pace and different game-plans that can be used during the match." The Feroz Shah Kotla wicket hasn't exactly been kind to pace bowlers in the recent past and Yadav feels that varying the pace is important. "The best way to bowl in our home ground is to vary our pace. But as is the case on all the pitches, we have to keep trying to create wicket-taking chances. Frankly speaking the Kotla pitch doesn't have any problem." Yadav is keen to make an impression for Delhi Daredevils in the fifth edition of the IPL, the franchise which brought him into limelight. "It was playing for Daredevils that made selectors and the world take notice of me. I have and will always keep giving my best for them so that I keep developing as a good pace bowler."